1. Natural Deodorant: If you want to avoid the parabens and aluminum found in many deodorants and antiperspirants, try a pinch of baking soda mixed with water instead. This simple paste makes an effective and simple natural deodorant. 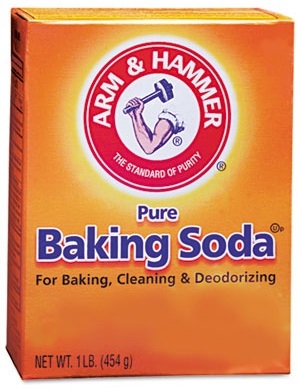 You can also simply brush some dry baking soda under your arms. 2. Insect Bites and Poison Ivy: Apply a paste made of baking soda and water to insect bites to help relieve itching. You can also try rubbing the dry powder onto your skin. This is also effective for itchy rashes and poison ivy. Baking soda helps to relieve minor skin irritation and itching by neutralizing toxins and irritants on your skin’s surface. 3. Heartburn, Indigestion, and Ulcer Pain: Most over-the-counter antacids contain some form of bicarbonate. Baking soda works by immediately neutralizing stomach acid, helping to relieve heartburn, indigestion and even ulcer pain. I have personally recommended this to many, including family members, and have been surprised how remarkably effective it is. Dosing is typically ½ teaspoon fully dissolved in a half a glass of water, taken every two hours (do not take more than seven ½ teaspoons in 24 hours, or three ½ teaspoons if you’re over 60). 4. Foot Soak and Exfoliator: Add three tablespoons of baking soda to a tub of warm water for an invigorating foot soak. You can scrub your feet with a baking soda paste for additional exfoliation. A paste made from three parts of baking soda combined with one part water can be used as an exfoliator for your face and body, too. It’s natural, inexpensive and gentle enough to use every day. 5. Relaxing Soak: Baking soda and apple cider make a wonderful spa-like bath for soaking. It also cleans the tub and the drain, as a bonus! 6. Hand Cleanser: Mix three parts baking soda with one part of water to make a natural hand cleanser that will scrub away dirt and neutralize odors. 7. Splinter removal: Add a tablespoon of baking soda to a small glass of water, then soak the affected area twice a day. Many splinters will come out on their own after a couple of days using this treatment. 8. Sunburn Remedy: Add ½ cup of baking soda to lukewarm bathwater, then soak in the tub for natural relief. When you get out, let your skin air dry, rather than toweling off the excess baking soda, for extra relief. You can also add a mixture of baking soda and water to a cool compress and apply it to the sunburn directly. 9. Enhanced Sports Performance: Distance runners have long engaged in a practice known as “soda doping” — or taking baking soda capsules — before races to enhance performance, a measure that’s thought to work similarly to carbohydrate loading. It’s also been shown to improve speed among swimmers. While I don’t suggest you try this at home, it’s another example of baking soda benefits. 10. Tooth and Gum Paste: Baking soda has a mild abrasive action that helps to remove plaque and polish, clean, and deodorize your teeth.7 One review of data from five controlled clinical studies found that toothpaste containing baking soda “enhanced plaque removal effectiveness of tooth brushing to a significantly greater extent” than brushing with a non-baking soda toothpaste. 11. Teeth whitener: For a natural way to whiten your teeth, crush one ripe strawberry and mix it with 1/2 teaspoon of baking soda. Spread the mixture onto your teeth and leave on for five minutes. Then brush your teeth and rinse. This method should be used no more than once a week, as excessive use could potentially damage your tooth enamel. Amazing things are posted on your blogs, and I’m very happy with them. Thank you so much, and I’m look ahead to contact you. Will you kindly drop me a mail? I’m new to this and stumbled on to this article. I have discovered this is positively helpful and has aided me loads. I am hoping to contribute and aid other people like it has helped me. Good job!!! Generally I do not respond to post/blogs, but I wish to say that this article has forced me into a response! Your writing taste has been amazed me. Thank you, quite nice article. Hi! I just wish to offer you a big thumbs up for the great info you have in this post. Thanks for ones marvelous posting! I genuinely enjoyed reading it. I will be sure to bookmark your blog and will often come back in the future. I want to encourage that you continue your great job, have a nice weekend! Hi there, I found your blog by the use of Google while searching for a comparable matter, it seems to be great. I have bookmarked it in my google bookmarks. I will be grateful if you continue this. Numerous people shall be benefited out of your writing. Cheers! Your style is so unique compared to other folks I’ve read stuff from. Many thanks for posting when you have the opportunity. Guess I will just bookmark this site. Hey! Quick question that’s completely off topic. Do you know how to make your site mobile friendly? My blog looks weird when viewing from my iphone4. I’m trying to find a template or plugin that might be able to fix this problem. If you have any recommendations, please share. Appreciate it! Spot on with this write-up, I honestly believe this website deserves a lot more attention. I’ll be returning to read more, Thanks for the information! Thank you, I have recently been looking for information on this subject and yours is the best I’ve came upon so far. What you typed was actually very reasonable. But, what about this? what if you added a little information? I ain’t saying your information is not solid, but suppose you added something that grabbed people’s attention? 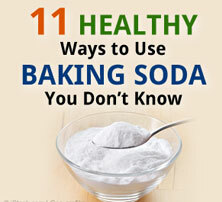 I mean Baking Soda – 11 Amazing Health Benefits is kinda vanilla. You might look at Yahoo’s front page and see how they write article titles to get people to open the links. You might try adding a video or a related pic or two to get people interested about everything you’ve written. Just my opinion, it might make your website a little livelier. I am really enjoying the theme/design of your web site. Do you ever run into any web browser compatibility issues? A couple of my blog visitors have complained about my site not operating correctly in Explorer but looks great in Opera. Do you have any tips to help fix this problem? It’s a pity you don’t have a donate button! I’d certainly donate to this brilliant blog! I guess for now I’ll will have to settle for book-marking and adding your RSS feed to my Google account. I look forward to brand new updates and will share this blog with my Facebook group. Talk soon! My brother suggested I might like this blog. He was totally right. This post truly made my day. You can’t imagine just how much time I had spent for this info! Thanks!